Morning Activity – We are excited to share that we have a partnership with Cyclebar Bend to put on a morning “Dance Party on a Bike” cycle class for conference attendees! Trust me, you DO NOT want to miss out on this exciting activity! There are LIMITED SPOTS so make sure to sign up now! Engagement Activity – Want to be entered into a raffle to win some AMAZING prizes? 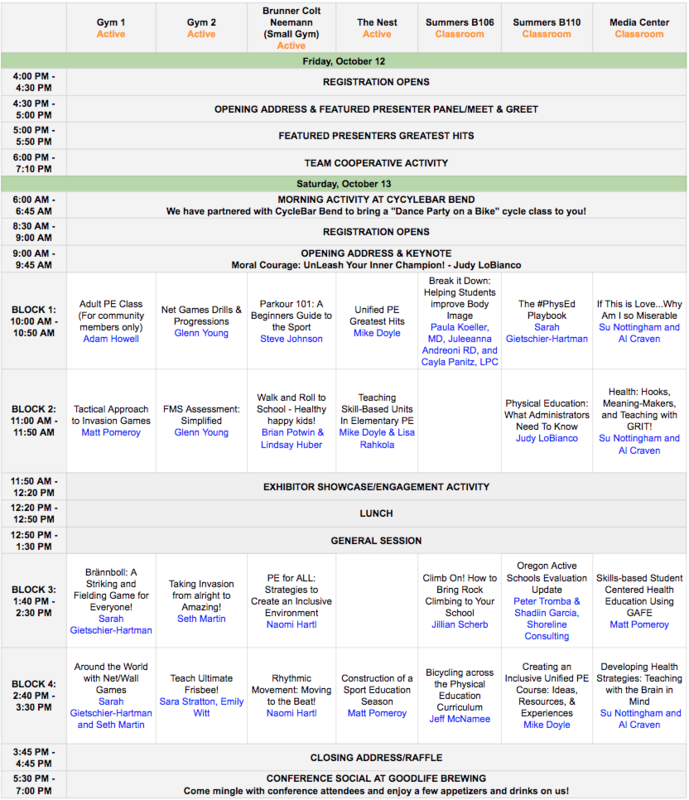 Here is how it works… find the BINGO card in your conference bag, complete all the tasks, “make connections“, enter the raffle, win prizes. It is that simple! I promise! Sponsored Social – Join us at GoodLife Brewing to help us wind down the conference. Take this opportunity to network and “make connections“ one last time. We want to thank Oregon Active Schools (who is brought to us by Kaiser Permanente, Northwest Health Foundation, and Nike) for sponsoring this social! This session will be a journey through the most basic terminology and movements of Parkour, to the more advanced. As educators, we teach a wide variety of learners in our classes, therefore this session will allow all those in attendance to find success and motivation to continue their journey of physical literacy both inside their classrooms and outside in nature! Would you like to learn how to create lessons that benefit ALL students? Join this session to learn how to create an inclusive environment with general and activity specific adaptations for skills, equipment and lead-up games, and how to actively engage all students in a general physical education setting. You will leave this session with a set of strategies that you can implement tomorrow. Let Sarah and Seth guide you through a memorable tour of New Orleans, Poland, Brazil, and Indonesia, where you’ll learn how to teach four net/wall games with step by step progressions (layers), primary and secondary rules, modifications, and a variety of tactical problems! To assist students in reaching the aims of the PE curriculum, assessment should be a continuous, collaborative and comprehensive process. An ongoing logistical challenge for teachers has been efficiently assessing FMS, which form the basic building blocks to developing physical literacy. A simple structure will be provided to enable teachers to focus on student learning rather than evaluating and reporting. Come dressed for moderate activity. Looking for a way to keep physical activity and learning at the forefront of your class? The TGfU/ tactical approach can do that. Come check out this session to learn the main concepts of teaching games for understanding. You will learn about proper lesson structure that incrementally increases in complexity. You will learn how to use grade level outcomes to be the driving force behind the lessons and activities. You can also participate in all the activities to get a feel and a better understanding of the TGfU approach. This session will discuss the void that exists between the principal’s office and the physical education classroom and ways to educate, advocate and empower teachers and administrators to improve instructional practice on behalf of every child. Sport Education can be one of the most rewarding models that a physical educator can use. Watch your students become leaders, empowered in their learning, and deeply engaged in each lesson, during a sport education season. Join this session to participate in and learn about the critical components of creating a successful sport education season for your physical education classes. Rhythmic Movement is a powerful and joyful content area for developing creative expression, motor skills, problem solving, and self-empowerment. Most physical activities have an inherent rhythm and therefore being able to move rhythmically is an important skill to learn. Attendees will learn the what, how and why of incorporating rhythmic movement into their physical education classes, see examples of cross-curricular units with PE, and take home new routines for dance, cardio drumming, and other rhythmic activities. One third of adolescents have been involved in an abusive or controlling relationship by the time they leave high school. This workshop will combine usable, student centered, interactive teaching strategies for recognizing unhealthy and building healthy relationships while allowing movement, discussion, and real life “meaning makers” in a non-sexist package. Learn about the many benefits of rock climbing, including how climbing can improve physical fitness levels while also developing cognitive and social-emotional skills. Discover the many different wall options available and the step-by-step process of securing a climbing wall. Safety and risk management protocols and fun climbing wall activities are also discussed. Participants will leave inspired and equipped with resources that will inform and support a planning process for acquiring a climbing wall. Ultimate Frisbee is a unique sport that challenges players at all levels. This growing and widespread sport has official rules, leagues and competitions nationally and internationally. Ultimate is a great sport for schools who are interested in trying something new and different with minimal costs. The equipment needed to play is few and relatively inexpensive. In addition, ultimate builds character and develops acceptance of responsibility for one’s own behavior. Through its concept of ‘Spirit of the Game’, where players make their own calls, participation develops character, self-reliance, listening and negotiating skills and leadership qualities. This active session will provide participants with a series of high activity drills and progressions for popular net games like badminton, pickle ball, and volleyball. Come and find out what Royals of the Court, Ball Machine, Around the World, and 12 Racquet drill are all about. As inclusion in school grows, so does the need for high quality resources and strategies to support educators. 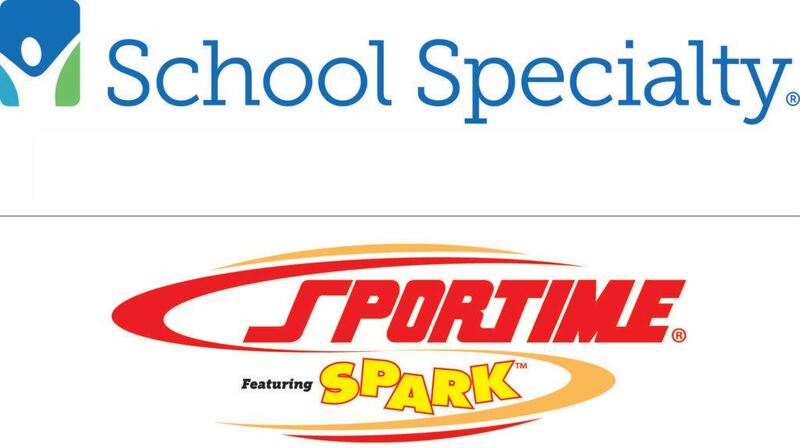 Special Olympics North America has worked with education leaders to create a Unified Physical Education Resource Guide. Unified PE is a unique opportunity for students of all ability levels and backgrounds to come together through meaningful fitness, sports, leadership and wellness activities. Walking and rolling to school is a fun way to live a healthy active lifestyle. Learn about bike and pedestrian safety education for your classroom/school and get engaged with the Oregon Safe Routes to School (SRTS) program. This session is anchored in everyday life experiences covering P.E. health and after school-based lesson plans. Active discussion about lessons, and easy plans for how you can use these lessons in your own program. Come connect with teachers and the Oregon SRTS Network to create fun, convenient and safe opportunities for students to walk and roll to and from school. Come learn how to play Brännboll, a fun and fast-paced striking and fielding game from Sweden! Sarah will provide tips and tricks to teach Brännboll, including a number of variations that allow the game to be played by students of all abilities. Your students will improve their confidence, communication, and cooperation, and have so much fun! Unified PE is a physical education environment which provides a unique opportunity for students with and without disabilities to come together through ongoing educational and physical activities. This session highlights activities and adaptations that are made for students with disabilities in the areas of outdoor pursuits, individual-performance activities, team sports, net/wall games, target games, and dance. Gain a classes attention, focus learning, make meaningful connections and foster student-centered culture through a wealth of quick to implement strategies for health education. Find or renew your Teacher GRIT (Get Revved In Teaching) to meet those challenges, and increase that joy! At a time when our field is literally a matter of life and death for the children that we serve, we must step up as champions on their behalf. Join the SHAPE America President to learn about how moral courage can be a game-changer for the profession! Lets look at creating skills based health lessons built around the National Health Education Standards while using Google Apps for Education. This session will help you experience different google tools that can be used in your class to make it more student centered and more empowering for everyone! At this session, participants will work collaboratively to start creating The #PhysEd Playbook, a go-to guide filled with highly effective instructional strategies that have a positive impact on student learning. The instructional strategies within the playbook will be organized around the themes of Purpose, Rituals & Routines, Differentiation, Formative Assessment, and Questioning. You will be able to use The #PhysEd Playbook as a starting point to create your own instructional guide for your classes. Minnesota recently revised the state Physical Education standards and benchmarks. A large problem in physical education is teaching team sports in elementary school, while the emphasis should focus on fundamental skill development and small sided games. Come learn how to implement quality activities through teaching skills while allowing for creativity, choice, ownership, and inclusion. What is known about brain development can help make learning more meaningful and teaching more effective. Participants will learn 5 things that need to happen for learning to occur, and experience strategies in health that address adolescent brain development to make those connections. The focus of our session is to use our multi-disciplinary expertise to demonstrate ways to encourage healthy, sustainable relationships to food and to body image in middle and high school students. Our presentation will explain how health is determined by behaviors, not by weight or size. We will discuss ways to encourage a healthy relationship to exercise, promote positive body image and reduce body shame. We will include a variety of didactic and experimental methods throughout the presentation. Finally we will explore ways to teach and communicate without weight bias. Learn how to build comprehensive understanding of invasion games with your students from 3rd grade to High School. Learn how to layer games while building a full understanding of the tactical problems found in Invasion type games. National longitudinal research shows correlation between a child’s behaviors and experiences and their adult health and likelihood to be a physically active. Oregon Active Schools interim outcomes (Access/Engagement/Partnership) directly affect many of these behaviors and experience. Come hear what we’ve learned and help us think where we should go next. In this hands on session we’ll continue the discussion about how to integrate bicycling into the K-12 physical education and design an elementary-based strider bike unit!